everydaytaichi lucy first annual world tai chi day was celebrated at center stage at Kahala Mall in Honolulu, Hawaii on April 26, 2014.
everydaytaichi lucy started her day by teaching Luk Tung Kuen Chinese exercise at 8 AM at Kahala Mall's center stage. Hear why this class was a special for a normal Saturday class. everydaytaichi lucy FIRST annual World Tai Chi Day was a memorable day! 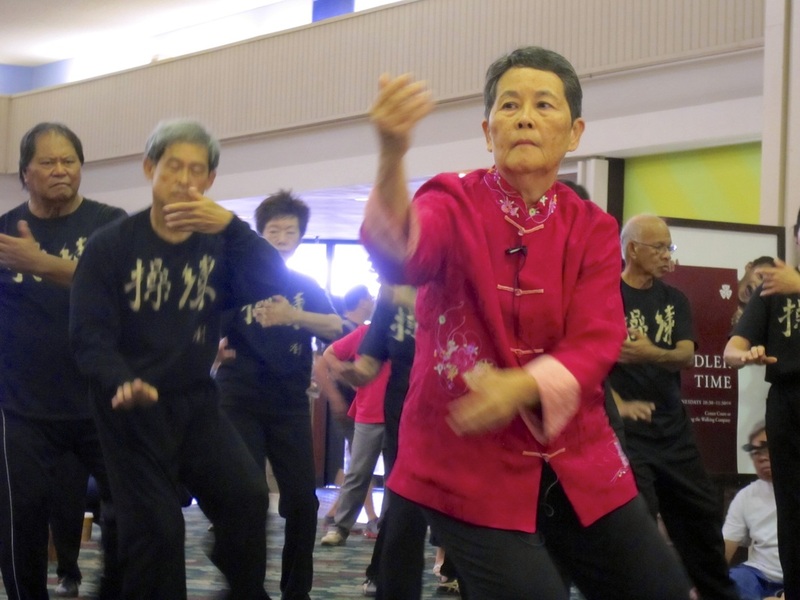 Kahala Mall's center stage was filled with scores of spectators and participants. It was an eventful Saturday bursting with excitement, fun and good will in our community. everydaytaichi students came out in full force to demonstrate Yang style and Chen style tai chi. They began their program at 10 o'clock in the morning with " a modified mini flash mob " by doing Yang 10 form at various locations fronting Starbucks, the Apple Store and Jamba Juice. If you had been among us, you, too, would have felt the power of chi that radiated throughout the mall! It seemed as though each person's energy was multiplied just through their presence. As we did our warm up exercise our audience readily joined in by moving along with us. It was truly a day that brought people together in a universal effort and displayed " one breath, one world." everydaytaichi students then demonstrated the most popular style of tai chi practiced world over, Yang 24 movement. The graceful performers unveiled their flowing movements in sync with the soothing music that played throughout the mall. This atmosphere brought a sense of calm and peace to all who were present. Our relaxed mood was reinforced with the next set, Yang 42. We then transitioned into tai chi sets that were more challenging. The 42 sword set continued to offer excitement and interest as our program then escalated to a dance that required full concentration and precision! That was not all...next was the Chen 36 Dao or saber tai chi set which was a spectacular performance that kept our spectators on edge. 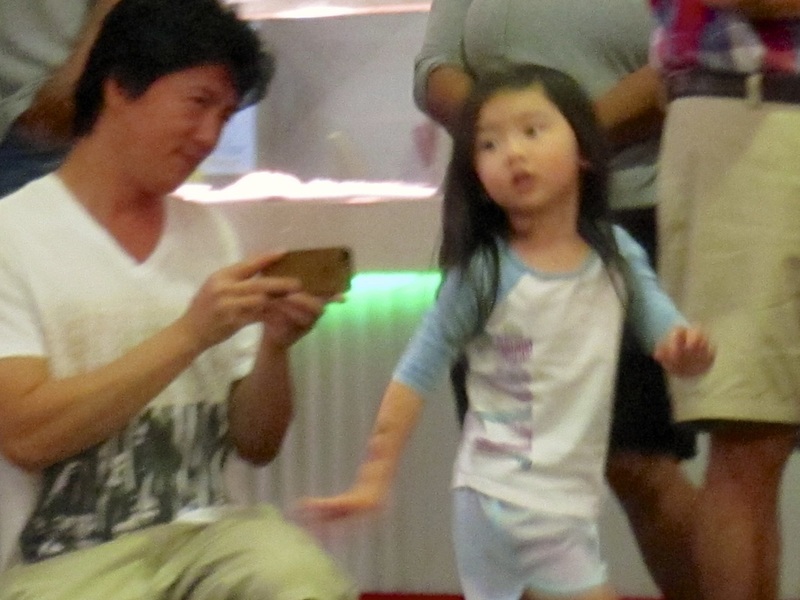 Tim's solo performance of Chen 24 fan proved to be yet another stunning variation of tai chi at its best. everydaytaichi family, altogether, some 60 participants, reinforced the peacefulness of our day by doing Yang 24 and Yang 10 forms, after many people in our audience then interacted with our group to experience what it feels like to play tai chi. 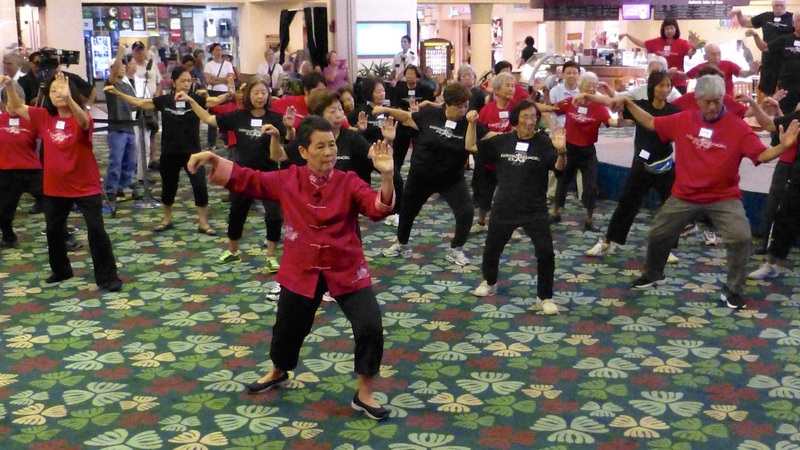 Our first annual WTCD at Kahala Mall was truly a huge success for both young and old as our everydaytaichi family shared our tai chi. A BIG mahalo to all who helped and supported our event. We appreciate the many photos and video footage from students, family and friends, as well as the continued support from our Olelo communtiy media ohana. We appreciate the advice from our creators at the Apple Store where we have spent a great amount of time editing our movies. To Kahala Mall's management team, thank you for accommodating us! See you next year for our 2nd annual World Tai Chi Day event. Last, but not least, our culminating activity was a memorable dim sum lunch at Happy Day restaurant where 50 people brought World Tai Chi Day to a nice closure! One morning at Luk Tung Kuen, the ladies were happy to see themselves online by using either the iPhone or laptop when lucy showed them this webpage.